If you dislike being the center of attention or live with social anxiety disorder (SAD), having a bridal shower thrown in your honor can stir up a lot of emotions. You may worry that your guests will be bored. You may be anxious about having to open gifts in front of everyone. If this is you, it's time to put together a strategy to get through the event. Below are eight tips to help you cope with social anxiety at a bridal shower. 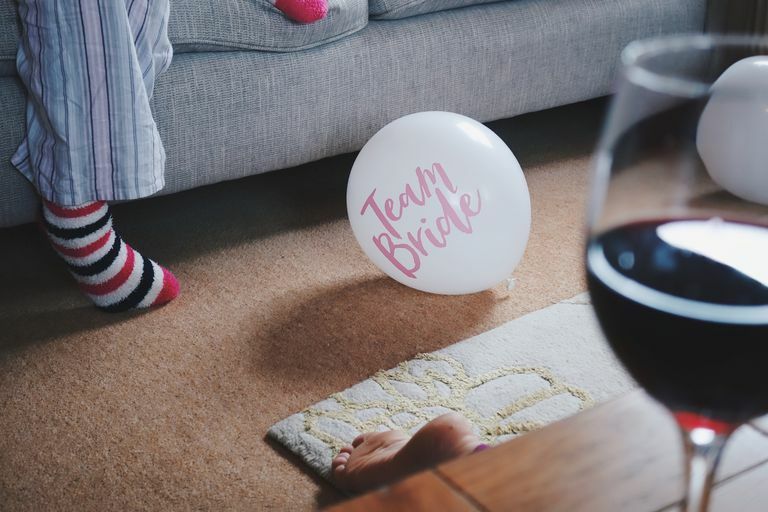 Whether your bridal shower is an afternoon gathering held in someone's home or a night out with friends, there are adjustments you can make to ensure your anxiety does not interfere with your enjoyment of the event. A good friend should be willing to accommodate your needs—after all, this is all about you! One way to approach this event is by acting in a way that is in accordance with your deeply held values, as suggested by acceptance and commitment-based approaches to therapy. From this perspective, take time to evaluate whether your behavior is lined up with what you value, regardless of your level of anxiety. Examples of values and beliefs might include setting limits and boundaries, accepting that life will involve some discomfort, and showing gratitude. Even if you experience anxiety, make a point of being a gracious guest. Have the hostess keep the shower small and intimate, inviting only people whom you know well. Limit the shower to a couple of hours. Most guests will tire of a longer shower, and keeping it short gives you a break if anxiety starts to become too much. If it's a night out on the town you are planning, have an exit strategy that gets you home by a reasonable hour. At an afternoon gathering, it is the job of your hostess to greet people at the door. Don't feel bad about taking a seat and letting people visit with you instead of trying to become a social butterfly. Remember that your guests want to celebrate with you and shower you with gifts. Also, don't feel guilty if you can't make the rounds and speak with everyone—they will make time to come around and speak with you. If you are truly anxious about opening gifts in front of everyone, have someone else help you out. Your future spouse or a younger relative could help, or you could even pass gifts out to the group and have everyone open a gift one-by-one. While it is easy to start worrying about whether everyone is enjoying themselves and if they want to be there, try not to spend time worrying about guests being bored. Most guests will be interested to see what gifts you have received and catch up with each other. Since you've set a time limit as well, guests who aren't enjoying themselves won't have to stay all that long. Gift registries may take the spontaneity out of gift-giving but they can be a lifesaver for the anxious bride. By giving guests a registry list, you avoid having to pretend to like something that you will never use. While games designed to embarrass you should be avoided, games that keep guests busy and interested can be useful. For example, during gift opening, your guests could play bingo. Hand out blank bingo cards and have everyone write in the gifts that they think you will receive. As the gifts are opened, guests mark their cards until someone yells "Bingo!" As another alternative, have the hostess serve cake right before gift opening to take the focus off of you. No matter how anxious you are during the shower, remember to be gracious. Hold up each gift for everyone to see, smile at the person who gave it to you and thank them. Thank your guests for coming as they leave. After the shower, send out thank you cards to your guests. Take the time to write a special note to each person, especially if you feel that your anxiety prevented you from connecting with them at the shower. Research shows that oxytocin (also known as the "love" hormone) is also a bit of an antidote for social anxiety. You can boost your oxytocin by petting an animal or hugging a loved one before the shower—or taking a quick break mid-event to gather up some of that feel-good hormone. In the end, try not to focus too much on being the center of attention for an afternoon. Your friends and family want to celebrate with you and give you gifts. Try to take some enjoyment from the event and treasure your special time as the guest of honor. Norton AR, Abbott MJ, Norberg MM, Hunt C. A systematic review of mindfulness and acceptance-based treatments for social anxiety disorder. J Clin Psychol. 2015;71(4):283-301.